Crosswhatfields? : Object to the No.1 Creekside development! Developers Bluecroft, who bought the MOT site in south Creekside opposite the Birds Nest pub, have put in for planning permission. Find their application here on the Lewisham Council planning portal (Ref DC/18/106708). To object, email planning@lewisham.gov.uk, put DC/18/106708 in the subject heading and be sure to include your name and address in the content. The deadline for objections was Thursday 14 June, but comments can still be received up until the application goes to the planning committee. Advice what you can include in your objection can be found here. Already the Birds Nest pub has over 2000 signatures on a petition it started only last week. Fears are that the development will threaten the future of the pub as a long-established live music venue. 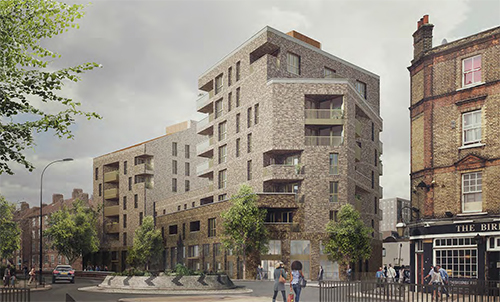 Lewisham Council are partners in the scheme, having exchanged the publicly owned strip of wild woodland adjacent to the MOT site (without any public consultation) in return for leasing commercial space in the building which they intend to rent out to provide income to fund council services. The submission has been made after next to no consultation with local people. The first and only public consultation event was held nine months ago, with no further information provided in the interim. We wonder if this is due to the involvement of the Council, who will be strongly invested in the scheme going through without opposition. The applicant's 'Statement of Community Involvement' states there were a "multitude of offers extended to the Crossfields estate" to discuss the plans but this is completely untrue! Crossfields Resident Association is a statutory consultee but has not heard a peep out of either Bluecroft or the Council. 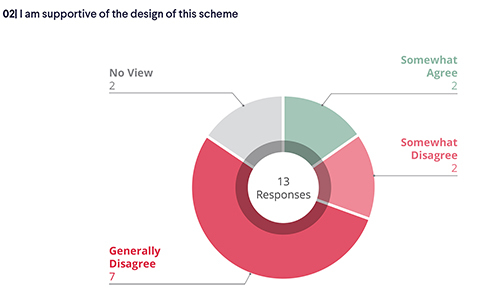 Perhaps this is because the feedback from the one single consultation event back in September 2017 (revealed in the applicant's 'Statement of Community Involvement') was shown to be almost overwhelmingly against the plans. – the impact of construction in an area already plagued by the pollution of construction work. After nine months, the applicant has failed to address any of those concerns. The scheme is still an over-development of the site, greatly impacting on the Conservation Zone. It says it's 8 storeys, but in fact it's 11 in the tower next to the Birds Nest and 9 in the south tower (there are two extra floors in the roofs and two in the double height ground floor). 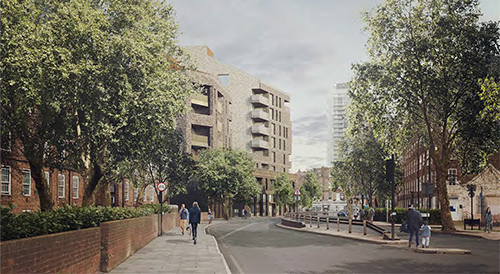 The scheme also fail to take into account the Council-led plan to develop Tidemill on this same corner; two new developments here will change the local character (one of open and green space) forever. A Daylight Assessment is supplied which shows that BRE guidelines are being breached in many cases, with overlooking issues for some. The impact of overshadowing by the building is shown for March, but omits the detail for June and December which usually accompanies such applications. The Arboricultural and Ecological Assessments both conclude the trees and green area that will be swallowed up by the scheme have no value, despite the pollution they help mitigate. The Ecology survey was done in winter, omitting to measure the abundant wildlife habitat of warmer months. The affordable housing quota is only 35% and the affordable units are separated from the private flats by a 'poor door'. The newly elected Labour administration pledged to "achieve 50% genuinely affordable homes in developer-led projects". There is no full business case provided to justify the need for the commercial space, nor any indication of rent levels. It is hinted that the space could be let out to all sorts of businesses rather than the creative uses it is said to accommodate. Lots of new workspace will be provided by other new developments in Creekside, and there is no shortage of un-let office and retail space in the area. No Construction Logistics Plan is provided to show how construction vehicles will enter and leave the site during the build. Although one cannot object to the disruption caused by construction, the air quality of Deptford Church Street is extremely poor, so any impact on traffic needs to be shown. We'll cover the development in more detail in the next post.